Cuckoo Tree Studio is where Denise Huddleston makes her distinctive art. Crisp, contemporary graphic images from an artist and designer with a lifelong passion for wild places, wildlife and waterscapes. Her creative career as art college lecturer, exhibiting textile artist and interior designer, resulted in her work featuring regularly in national magazines and on television. After one assignment, training teachers in the Scottish Highlands ‘Skye reached out and grabbed her’ After many years living and working in the Lake District, Denise and her husband Bob made the move to Skye. Five years ago, Denise made the decision to step sideways from textile art and with renewed interest in printmaking, she spent two years developing her designs into a small art collection and ‘Cuckoo Tree’ was born. A cuckoo calling loudly from a nearby tree prompted the name . . not the recommended basis for a new venture, but it was a start. Working in their tiny cottage proved challenging before the move to 12 Lochbay. After a year of renovation and hard work, Denise and Bob quietly opened the studio door to visitors in Summer 2016 and haven’t looked back. Visitors can learn about the process and watch demonstrations as Denise creates her Original Art . . Unique Jewellery . . Affordable Prints . . Handprinted Textiles and Greetings Cards in the working studio and display area. Situated on the main road into Waternish, they often feel they are the Tourist Information Office. Where to eat? Where to drink? Where to go for a walk? Where’s the loo? And most days, Is this the tannery/SkyeSkyns? as their SatNav tells them, they have arrived at their destination . . . However; on a recent, warm, August Sunday this request was rather more urgent . .
A couple from Carbost area had taken their visiting family and grandchildren out to Isay on the family boat. After their return to Stein, the pregnant daughter-in-law felt slightly unwell and thought she must have eaten something which had upset her. Her baby wasn’t due for another 5 weeks, but in the short space of time it took to drive up the hill, it was clear that baby was coming . . and coming fast . . Granny rushed into the studio, asking calmly and politely if she could bring her into the house to have the baby. For once, Bob was speechless and called for Denise! With sheets and towels from Bob’s newly ironed laundry pile, they dashed outside to find a tiny baby boy already making his entrance into the world at the roadside. It was mum’s third baby and she appeared to be very much in control of the situation. Within minutes, new mum with baby attached, managed to walk to Lusta holiday cottage, next door, to await the ambulance. With other helpers around, Denise took the other two delightful children, Ned and Phoebe, into the studio and settled them down with home-made lemonade and shortbread. They chose cards and wrote messages. Mum said they were the earliest baby congratulations cards she had ever had! Yes, it was quite a day! Recently, Denise was contacted by Channel 4 TV asking for permission to use her art prints in a new TV programme. 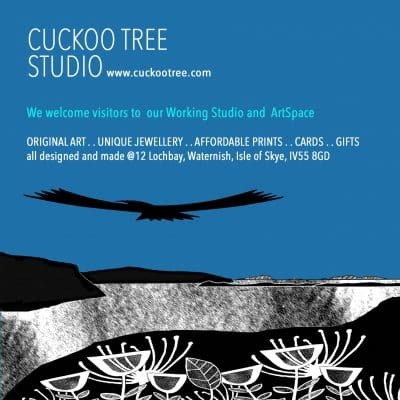 Last autumn, a lovely young couple from Bristol bought two prints from Cuckoo Tree for their new home. The couple’s home is now the subject of a new ‘home makeover’ programme. The designer loves the artwork and wants to use them in the makeover. It appears to be a modern day version of ‘Changing Rooms’ called ‘Bang on Budget’ with some of the original cast . . Handy Andy being one. More details to follow . .